In 2019, the windmill will be open to the public from 2 pm to 5 pm on Sundays and Bank Holiday Mondays from Sunday 7th April to Sunday 29th September. Bank Holiday Monday Open Days: 22nd April, 6th May, 27th May, 26th August. (all 2pm - 5pm). For National Mills Weekend: Open on Saturday 11th May (2pm - 5pm) & Sunday 12th May (11am - 5pm). Admission Charges for 2019: Adult £2.50, Child (5 to 15) £1.00. All children must be accompanied by an adult. Please note that on very rare occasions the windmill may close in extreme weather conditions, such as High Winds or Thunderstorms. Whenever possible, we will try to put a note about a closure on this website. We are sorry to disappoint anybody who could not visit the windmill on 29th July. Strong winds with gusts up to 40 mph were forecast. In our exposed position on the Chiltern escarpment winds can be accelerated to higher levels. In strong winds windmills can suffer damage so, in line with our procedures, the decision not to open had to be taken for the safety of our Visitors and Volunteers. We are sorry to disappoint anybody who could not visit the windmill at the Bank Holiday Weekend. A windmill in such an exposed position as Lacey Green (standing 750 feet above sea level on the Chiltern Escarpment) is not an advisable place to be in a thunderstorm. In line with our procedures, the decision not to open had to be taken for the safety of our Visitors and Volunteers. We monitored 10 Weather Forecasting websites over the weekend, which proved to be inconsistent and unreliable. The conditions were very extreme and in the event, at Lacey Green, there were two exceptionally heavy thunderstorms during that weekend, with lightning strikes and thunder nearby every day from 24th to 31st May. For a long time I have been hoping to refresh this website. One reason is to make the navigation easier, so this is now done with an identical Tab Bar at the top of every page. I have kept the overall look similar to before, but I have converted it all to a more up to date system. This means that I can now easily make various changes right across the website. A particular example is that on any occasional days when the weather prevents us opening the windmill, then a prominent notice can quickly be displayed at the top of every page. More pages have been added, with updated news from the last couple of years, and more will follow in due course, and events from past years as well, such as our Sheaf to Loaf Day in 1998. Nowadays people look at websites on all sorts of devices with all sorts of screen sizes. I have therefore made adjustments to the layout, and restricted the width of our pages (to 960 pixels) and in tests they seem to be viewable on a reasonably sized phone screen. Any comments on the website, including telling me of any mistakes and links that do not work, will be welcomed via our Contact Page. A group of people (who open Cromer windmill in Hertfordshire to visitors) visited Lacey Green Windmill. Apparently they have an annual excursion that is organised for them by the Hertfordshire Building Preservation Trust, which owns Cromer Windmill. Cromer, in case you did not know, is to the NE of Stevenage. It is a Post Mill but I had found a number of similarities that our two mills shared to tell them about. 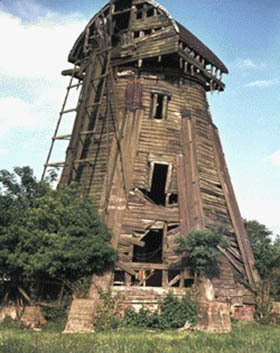 The two mills both date from a similar time in the 17th Century, they both fell out of use at similar times, they both had repairs done in the 1930s, and their conditions were both causing concern in the mid 1960s, which led to them both having extensive restorations done over many years. It is always useful to share experiences with like-minded people who do similar work to ourselves. The main difference with the people who visited us, is that they do not get involved with actual work on the mill itself, that is the responsibility of other people in their charity. Having painted the sails in 2015, it was 2017 when we could paint the Smock and Cap, which had not been done since 2008. It was a longer job than before, as we had decided to put extra effort into cleaning off more of the old material than had ever been done since the weatherboarding was first painted 37 years earlier, in 1980. It all took two weeks work, during which the weather was generally kind to us, and we used 100 litres of paint giving the smock, cap, and fanstage 2 or 3 coats. As the apex of the cap is 40 feet or 12.2 metres above the ground, we have to hire some fairly substantial access equipment in the form af a cherry-picker. Below is one photo of the work being done, otherwise I have written a seperate page on it, which can be reached by clicking on Painting 2017. 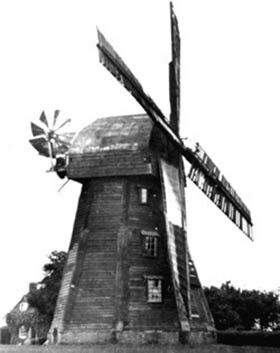 Wycombe District Council's Malcolm Dean Design Award for 1986 was presented to Lacey Green Windmill. 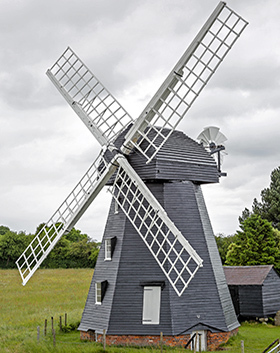 The Chairman of the Council said that the Award was made for Excellence of Design and Achievement, and the windmill was an example to the whole county, not just Wycombe District. Further details will be put another page. The 86th Engineering Haritage Award was presented to Lacey Green Windmill by the Institution of Mechanical Engineers. Read more at: EHA Summary Page which also leads to a page on the Presentation Ceremony, and a pdf of all the speeches made on the day. 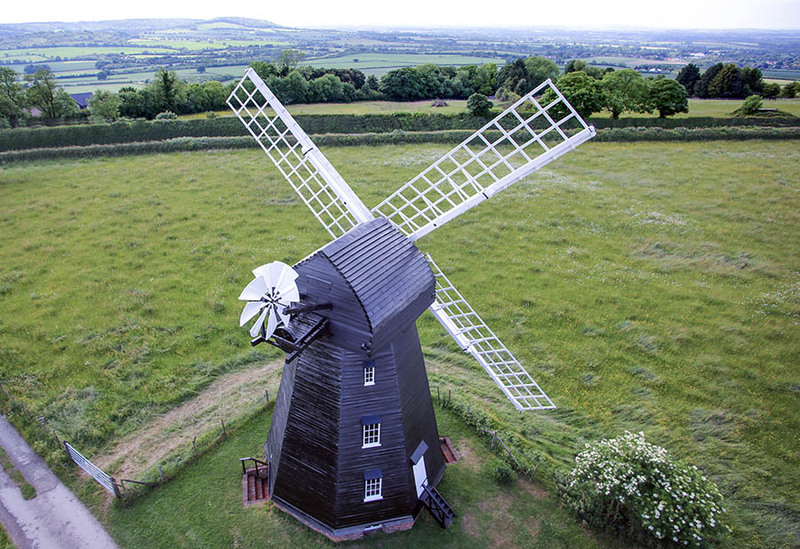 The position of Lacey Green Windmill is at the very least an unusual one for a windmill, with the ground being 750 feet above sea level, making the tips of the sails 800 feet above sea level. It also makes Lacey Green (with the possible exception of Stokenchurch) the highest village on the Chiltern Hills. From outside the windmill, because of hedges having grown higher than they were, one can no longer appreciate the views over the Vale of Aylesbury, but you can do from the windows higher up in the windmill. Of course, the most spectacular local views are from the tops of Brush Hill and Whiteleaf Hill, both properties now being cared for by The Chiltern Society, and both just 2 miles around the escarpment from Lacey Green Windmill. It is certainly true that (on a clear day) one can see parts of the Cotswolds from this area of the escarpment, with Chipping Norton being the nearest place. However, from the top of the windmill, we are also able to look in the opposite direction, and right over the rest of the Chilterns looking towards London. The atmosphere is not often clear enough to see that far, but one day in June 2017 I was able to take the photo below which shows the BT Tower on the left, and on the right is the Arch over Wembley Stadium which is in front of the Shard by London Bridge station, which is 36 miles from Lacey Green. 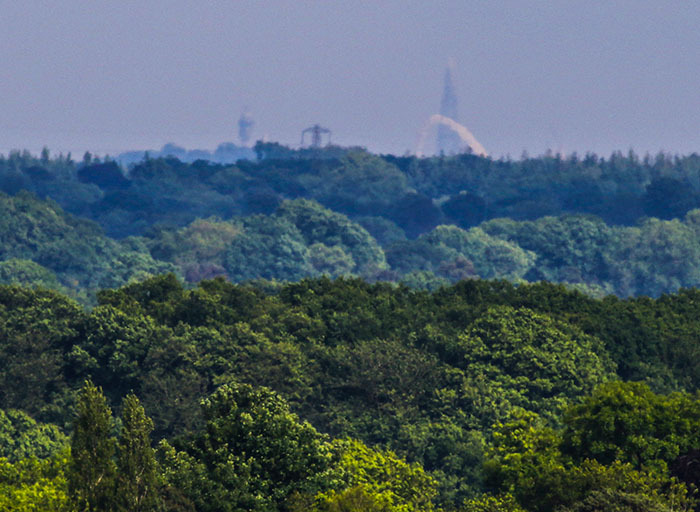 Along the skyline: BT Tower / Electricity Pylon on Chilterns / Wembley Stadium Arch in front of the Shard. In case you wondered, the view at the top of this page, looking down on the windmill, was taken from this cherry-picker (or boom-lift) in June 2017, after we had finished painting the windmill. 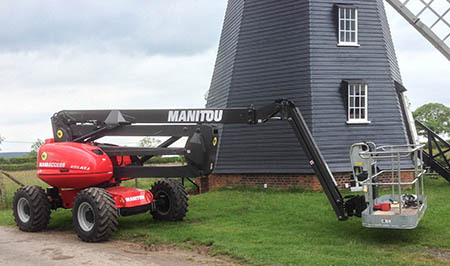 The cherry-picker was extended to its full vertical height of 20 metres, or 65 feet. 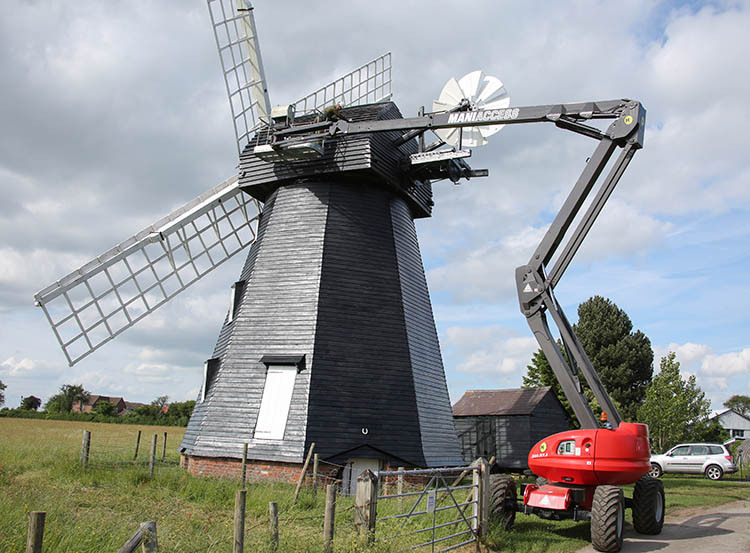 This website has been compiled by Michael G Hardy, Honorary Secretary of Windmill Restoration Committee from 1984 to 2014, Windmill Manager and Committee Chairman since 2015. This page ( index.php ) was last updated on 28 February 2018. The Chiltern Society is a Registered Charity No 1085163 and a Company Limited by Guarantee Registered in England and Wales Registration No 4138448.